All Salons & Spas are looking for new ways to market their salon. 1. Create a clean, professional, easy-to-use website for your customers that attracts and converts. 2. Utilize social media ads to target prospective customers. 3. Write informational content about your business on your site. 4. Start a blog. Content marketing is one of the best ways to get new customers online. 5. Use lots of good calls to action on your website for onsite conversions. 6. Create a video to use in online marketing efforts. 7. Optimize your website for search engines so that you rank higher and are easier to find. 8. Advertise in an online/offline Salon magazine (preferably local). 9. Create a Salon & Spa Brochure for your business. Market the salon & spa to new prospective customers living in your target area. 10. Send out a coupon mailer to increase your customer loyalty using a very cost effective direct marketing strategy. 11. Use social media to communicate with your followers. Remember to post about your work and any specials. Ask for customers to give you a review. 12. Attend local events, and get involved with the community. This will help your online marketing with some face to face time. 13. Track and follow your competitors one to see what they are doing to gain customers. 14. Send thank you emails for showing your appreciation to your customers. 15. Try using SMS text messaging to market to your customers. 16. Use a point-based loyalty program for salon & spa products and services. 17. Send out a survey to see how your salon is doing and gain insight from your customers. 18. Create events and contests that help spread the word about our business through social media. 19. Get involved in local and national Salon & Spa Events and have them showcase your efforts and link back to your website. 20. Find local charities and community organizations to showcase and link back to your Salon & Spa. 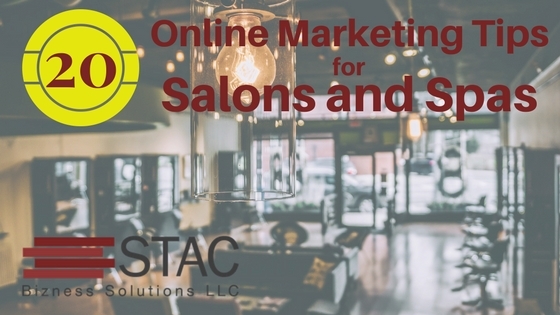 Start using these online marketing tips for your salon & spa, and watch your beauty salon & spa grow! Your main goal is to get clients to come in so you can, in turn, provide them with a great experience, so make sure to use technology to help you. So, let STAC Bizness Solutions help you with your Salon Bookkeeping. If you’re looking for help managing your books, we provide salon business cloud bookkeeping programs to match any salon or franchise salon business requirement. Here is more information on our salon business bookkeeping services. Our team are all Quickbooks ProAdvisors. Meet our Team. Contact STAC Bizness Solutions today to see if we can help. We will provide you with a no-obligation FREE consultation!